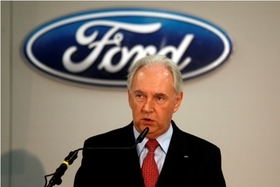 Ford is boosting production globally, says manufacturing boss Fleming. DETROIT -- Ford Motor Co. is adding seven manufacturing plants around the world, including four in Asia, says John Fleming, executive vice president of global manufacturing. That includes two assembly plants in China and one each in India and Thailand. Ford also will build engine plants in India and China and a transmission plant in China. In North America during the first quarter, Ford will add a third shift at its Michigan Assembly Plant in Wayne, Michigan, where it has started building pre-production versions of the Ford Focus Electric. Ford also builds gasoline-engine Focus cars at Michigan Assembly and will begin building the C-Max Hybrid and plug-in hybrid C-Max Energi there this year. The third shift will mean about 1,200 jobs, Fleming said. Ford is adding a second and third shift at its Louisville, Kentucky, plant, where it will build the redesigned Escape, increasing the work force to 4,200, from 1,100. Ford also is spending $1.1 billion to convert its Kansas City factory from production of the current Escape to the Transit commercial van. Ford also will add a second shift for F-150 production at Kansas City. The various U.S. expansion projects are part of 12,000 jobs the company is adding since the new contract it signed with the United Auto Workers last year.